Russia will provide Cuba with $US 20 million worth of credit, in line with an agreement signed on Friday between the two countries. This comes during the week-long official visit of the Cuban leader to Moscow. Russia will also send 100 million tones of grain as humanitarian aid to Cuba. Last autumn, three hurricanes tore through the area. Russia has already sent four planes carrying humanitarian aid to the island. “Our credit line is aimed for delivering construction and power equipment, as well as equipment for agriculture. Our work will be focused in the areas that suffered most from recent hurricanes,” Deputy PM Igor Sechin said. In addition, Presidents Dmitry Medvedev and Raul Castro have put their signatures to a strategic partnership memorandum. “This is a historic moment in our relations. Russia and Cuba have always been close friends in both good and tough times. We have a vast experience of cooperation and this meeting is a new step forward,” Raul Castro said. Following the formal meeting between the two leaders, a range of interministerial agreements concerning co-operation in aircraft construction, car building, sports, tourism and fishery have been sealed. “Co-operation on all issues is set to continue. I believe we have good prospects in trade, economic and humanitarian fields,” he said. “The trade we have today is pretty moderate, though we could increase that considerably. 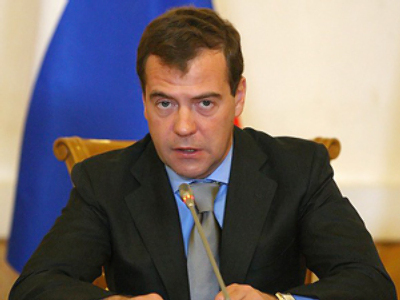 In the majority of projects there are interesting ideas and it will help us make them happen,” Medvedev added. Raul Castro and his brother, Cuban leader Fidel Castro, were frequent and favourite guests of the Soviet leadership. In 1963 Fidel spent 45 days traveling throughout the USSR. He secretly arrived in Murmansk and checked on Soviet nuclear forces, continued to Lake Baikal and received a brown bear cub as a present and did a little bit of shopping in Tashkent. Pictures of the Comandante on a train were on the front pages of all Soviet newspapers. Raul often followed his older brother, but this time he is in Russia by himself and now he is the Cuban leader. Raul Castro will be in Russia until February 4. On Thursday he decided to stay in accommodations outside of Moscow so he could enjoy the Russian winter. And that is something Russia is ready to provide in abundance. Castro arrived at the presidential residence wrapped in a warm coat and wearing an ushanka – a traditional Russian hat, which all tourists bring from Moscow. Medvedev met him as an old friend although they have an era in between their ages. “I am very glad to see you here in Russia and especially in this place which – as I know – you visited many years ago,” Dmitry Medvedev said. 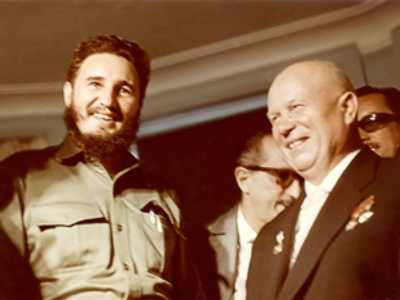 In the 1960s, Nikita Khrushchev hosted Raul and his brother at the same residence. Then, Fidel was feted to a full Russian experience including a Russian hunt and shots of vodka. “I have been missing Russian forests. The moments when I was frying a lard spit on a twig to eat with rye bread I held dear to my heart. Over 25 years have passed, filled with this feeling of nostalgia. I don’t know if I will be so lucky to have the chance to taste it again, but I am here,” Raul Castro said. Medvedev got the hint. After talks, they went outside for a dinner by the fire – pickled vegetables, barbecue, rye bread and a samovar – the self-boiler traditionally used in Russia’s tea-drinking – were on the menu. 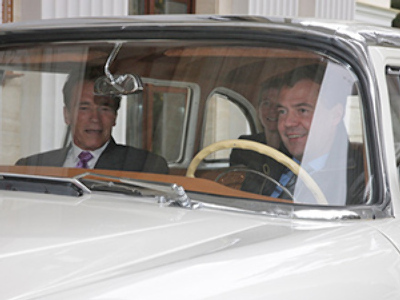 “This is ‘salo’ or bacon fat – something you should have come for,” President Medvedev said. After the collapse of the Soviet Union it seemed relations with Cuba collapsed as well. Located right at the U.S. doorstep, Cuba was the largest ally of the USSR and considered a true brother-in-arms. In 2002 Russia shut down its military base in Cuba. Two months ago, Medvedev landed in Havana along with a contingent of the Russian Navy. Many expect the current talks to focus on civil cooperation, with energy topping the agenda. “The basis for our relations today is economic cooperation. Although, we should not forget about our contacts in the military sphere,” Mikhail Kamynin, the Russian Ambassador to Cuba said. Cuba – old new ally?